Between July 4th and 9th Peter Kus took part at the ON THE EDGE festival in Birmingham, UK. The festival was conceived as an artistic gathering event of the international association of the theater for children and youth ASSITEJ. Inside the four year periods between the congresses of ASSITEJ (the next one will be in May 2017 in Cape Town), TYA practitioners, artists, producers and researchers meet on yearly gatherings, organized in various cities around the globe. One of them was ”On the Edge” in Birminghm, UK. Besides the selection of the best TYA productions from around the world, it also offered a rich program of workshops, an artistic symposium, meetings and work-in-progress showcases. It was organized by TYA UK in TYA Ireland – both members of ASSITEJ International. in the main program of the festival ont he July 6th he led a workshop entitled New Perspectives in the Use of Music in Theatre for Young Audiences. 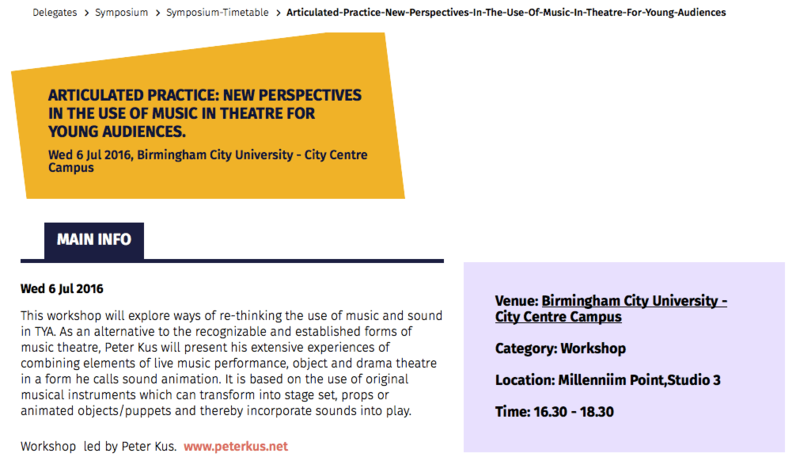 In it he explored ways of re-thinking the use of music and sound in TYA. As an alternative to the recognizable and established forms of music theatre, he presented his extensive experiences of combining elements of live music performance, object and drama theatre in a form he calls sound animation. It is based on the use of original musical instruments which can transform into stage set, props or animated objects/puppets and thereby incorporate sounds into play. 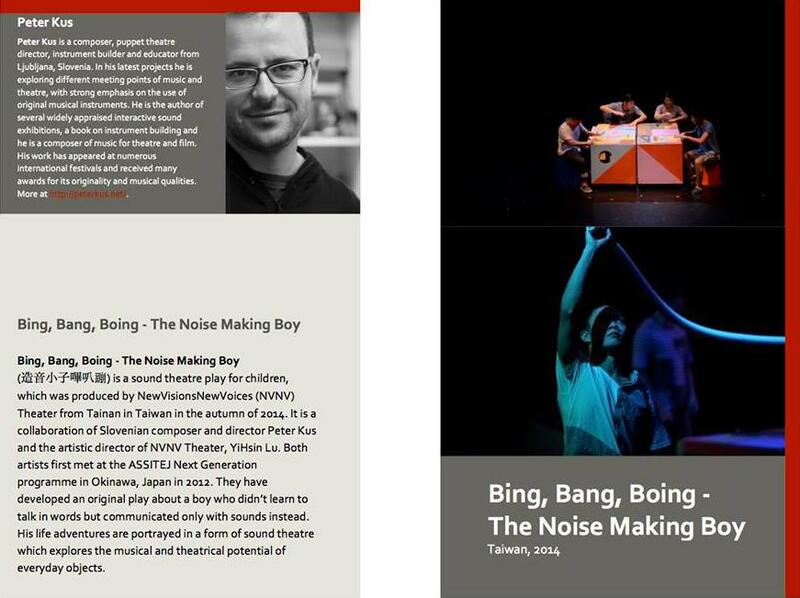 on the Next Generation Alumni Symposium, July 4th he presented the project Bing, Bang, Boing – The Noise Making Boy (造音小子嗶叭蹦), a sound theater play for children, which was produced by NewVisionsNewVoices (NVNV) Theater from Tainan in Taiwan in the fall of 2014. It was a collaboration with the artistic director of NVNV theater YiHsin Lu. Both artists first met at the ASSITEJ Next Generation program at Okinawa, Japan in 2012.